Telstar 1 assembly at Bell Labs (Credits: Arthur Dennis). July 10, 2012 marks the 50th anniversary of the launch of Telestar-1 from Cape Canaveral, Florida. The launch of Telestar-1 allowed the first live television transmissions two weeks later on July 23, 1962, which were live television pictures of the Eiffel Tower and the Statue of Liberty. The National Air and Space Museum’s Space History and Education divisions, in association with the French Embassy, will host a symposium to commemorate the 50th anniversary of the Telstar satellite on July 12, 2012. Although Telstar-1 was not the first communications satellite, it is the most familiar and is considered by most experts to have ushered in the era of satellite communications as a result of the public impact of the first transmission of live television across the Atlantic Ocean. What most do not realize is that Telstar-1 also ushered in the era of commercial space. Telstar-1 was a collaborative effort between AT&T, Bell Telephone Laboratories, and NASA. It was built by the authorization of the new space policy delineated by the Eisenhower Administration in December 1960, which granted private industry the opportunity to advance satellite communications under the direction of NASA. 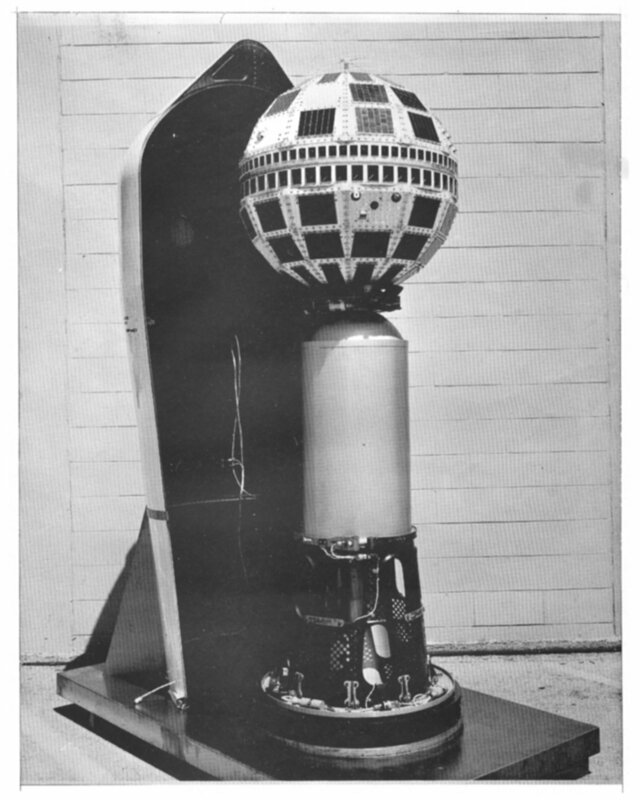 Telstar-1 was financed by AT&T and built by Bell Telephone Laboratories with corporate funds from AT&T. AT&T built six flight worthy spacecraft, launched two of them using company funds, and built the ground stations. Bell Labs developed a great deal of the technology required for satellite communications including transistors, solar cells, and TWT amplifiers. Telstar-1 was launched by NASA aboard a Delta rocket. 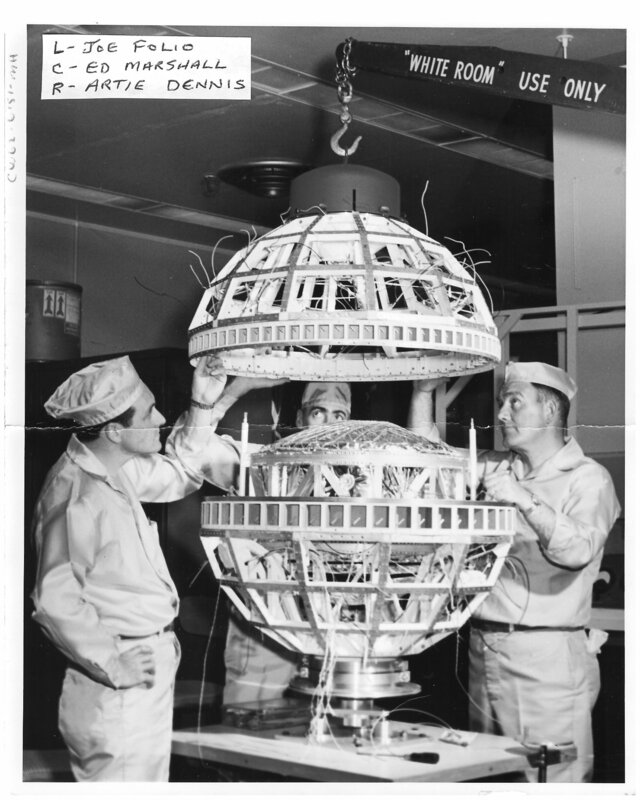 Telstar 1 prior to its encapsulation for launch (Credits: Arthur Dennis). Unlike many of today’s communication satellites, which reside in geosynchronous orbit some 35,785 km (22,236 miles) above the equator, Telstar-1 occupied an orbit ranging from 5,643 km (3,506 miles) at its farthest point and 945 km (587 miles) at its closest approach. This orbit brought the satellite within the Earth’s Van Allen radiation belts. Because of this orbit, Telstar-1 in addition to providing a test-bed for communications also carried an experiment designed to measure the energetic proton and electron distribution in the Van Allen belts. Ironically, it was furtherance of this mission that may have led to Telstar-1’s premature demise. On November 23, 1962, the command channel to the satellite was lost by its ground controllers. Contact was reestablished on December 20, 1962, and sporadic data was received until all transmissions ceased on February 21, 1963. It is suspected that Telstar’s failure was related to the test of a nuclear weapon prior to the launch of Telstar-1. On July 9, 1962, one day before Telstar-1’s launch, the United States Air Force launched a 2,200-pound W-49 nuclear warhead into space aboard a Thor missile and detonated it 248 miles (400 km) above a point 19 miles (31 km) southwest of Johnston Island in the Pacific Ocean. The warhead detonated with a yield of 1.44 megatons. The test, code-named Starfish Prime, is the most powerful and highest space nuclear test ever conducted by either the United States or the Soviet Union during the Cold War. It produced a flash of light visible over much of the Pacific Ocean and artificial aurora for seven minutes after the explosion in the skies over Hawaii, Tonga, and Samoa. The blast’s electromagnetic pulse damaged electrical systems on Oahu, which was 800 miles (1,287 km) from the explosion. Telstar-1 was designed to survive the natural radiation within the Van Allen belts, but it is suspected that radiation saturated within the Van Allen belts from the test may have overcome the satellite’s systems. It is notable that Telstar-1 was likely not the only casualty as there were other satellites orbiting within the Van Allen belts during and after the test.